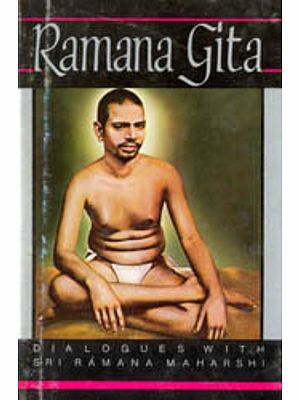 The Astavakra Gita is a unique text among the world's contemplative classics dealing systematically with the mystical experiences of the Self on its way to transcendence, peace and bliss. There are few ancient treatises in East or West which evince such profound and lively concern with the Supreme Self as the ultimate reality, embodied in mystical insight and experience, and written with such spiritual imagi- nation and poetic fervour. 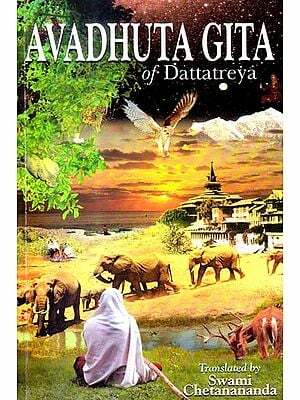 It may, indeed, be compared with the Dialogues of Plato, the Tao Teh King and the Bhagavad Gita that all record universal insights and experiences of medi- tation which belong to the heritage of entire mankind. 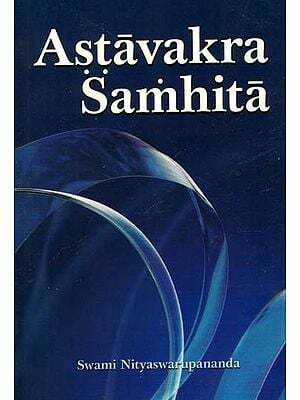 Astavakra' s teaching in respect of the cosmic Self is presented in the form of his dialogue with Janaka, the magnificent King of Videha, about whom we read so much in the Ramayana, the Mahabharata and Brhadranyaka Upanisad. 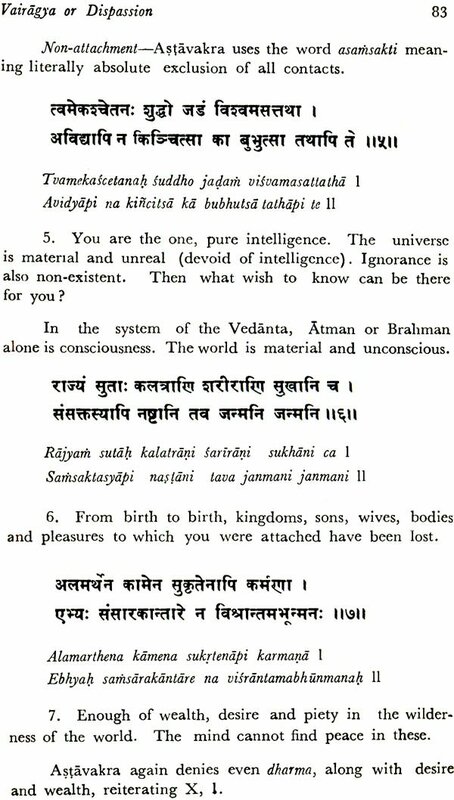 Although the evidence is not clear and definite, Astavakra of this text is probably the same as the holy sage of the eight- curved body of the Mahabharata ; while Janaka, his disciple here, is identical with the renowned King-seer (rajasi) of Videha and father of sita, spouse of Ramacandra, in both the epics. 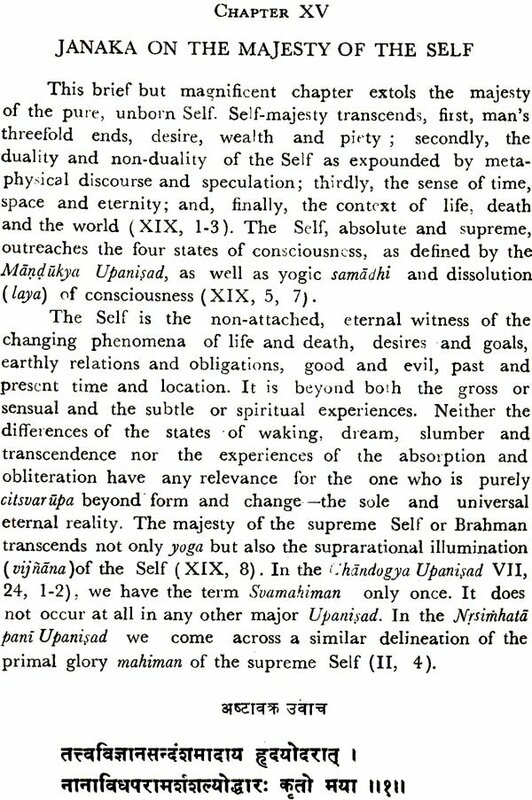 It is the same King-seer whom Yajnavalkya teaches the birth of the Supreme Self in the Brhadaranyaka Upanisad (IV, 2, 4; 3, 1) and who stimulates a metaphysical debate between this sage-teacher and a group of Brahmana rsis in the same Upanisad (III, 1, I). 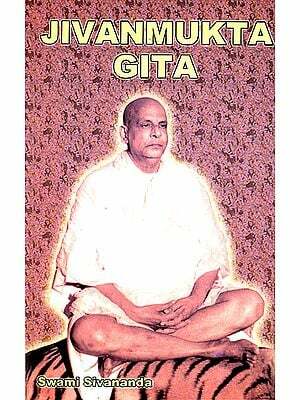 It is noteworthy that he is also depicted as the splendid model of the wise man in the Bhagavad Gita (III, 20, 25). In the Mahabhdrata we find Janaka making the following oft- quoted observation. "Infinite is, indeed, my wealth of which nothing is mine. If Mithila is burnt, nothing that is -mine is burnt" [Santiparva, VII, 1 ). 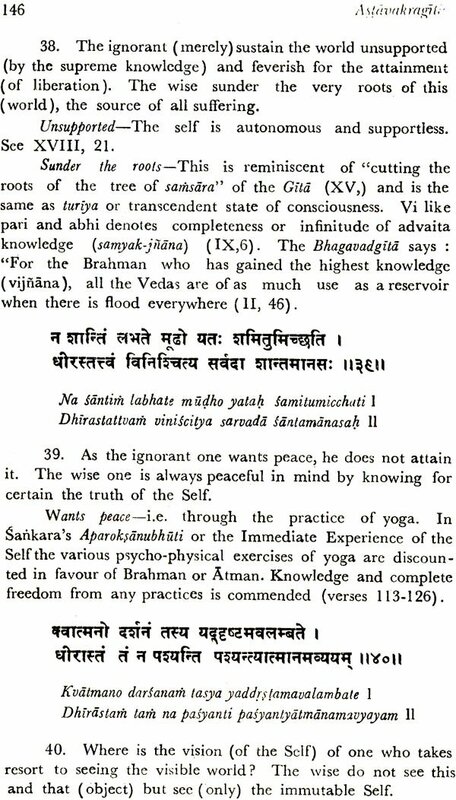 In the Astavakra Gita 'me nasti kincana athava me sarvam'(II, 14) is similarly echoed by Janaka. The spirit of the magnificent trio, Anavakra, Yajnavalkya and Janaka ,is identical-the quest and vision of the Self (atma-Brahma-anusandhana-anubhava). 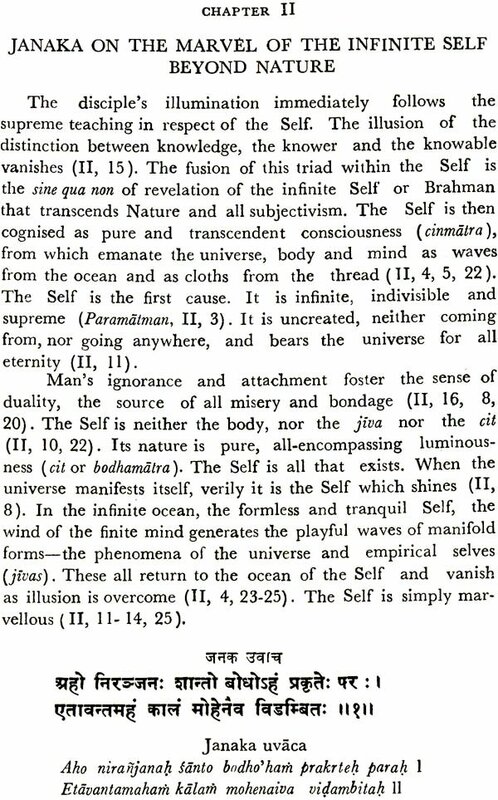 The true self, as taught by both Astavakra and Yajnavalkya to King Janaka, is infinite:Akasam atma, says Yajnavalkya in the Brhadaranyaka Upanisad (III, 2, 13); "boundless as Space is the Self; the phenomenal world is like a water-pot", observes Astavakra (VI, I). The Self is all pervasive, formless, subtle, bound- less and stainless as the sky. "That great unborn Self who is undecaying, undying, immortal, fearless Brahman" (Brhada- ranyaka Upanisad, IV, 4, 25). In the Astavakra Gita we read, "May be a king or a beggar, he shines who is unattached". King Janaka in both the epics is the fully liberated, unattached being (jivanmukta) who carries on in a disinterested manner his duties of life for the integration of the world-order (what the Bhagavad Gita calls Lokasamgraha), unaffected by the human condition. He is, therefore, the most appropriate disciple for being instructed in the truth of the supreme self by Astavakra in our text, leading to his withdrawal into the silence and bliss of the Absolute. 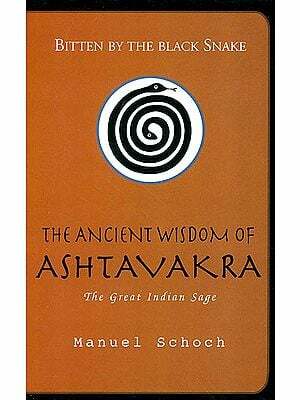 The legend about Astavakra is fully given in the Mahabharata (Vanaparva, 132-134). The sage was born a cripple, crooked on eight parts of his body, due to the curse of his father, the great rsi Kahoda. While he had been in his mother's womb, he became so learned and wise that he expostulated with his father who had been reading the whole night. The enraged father cursed the embryc. This was the cause of the eight- fold twisting of Astavakra's limbs as he came out of his mother's body. Later on, Kahoda went to the court of Janaka where he was defeated in an intellectual duel with Vandin. As a result he was immersed into the ocean. For years no- body in his family knew about this. When Astavakra was only twelve, he came to ascertain from Svetaketu about the fate of his father. He and Svetaketu then journeyed to the court of Janaka for challenging Vandin in a philosophical debate. Astavakra there declared to Janaka from whom he sought permission for entering into the intellec- tual combat, "I have Come before the Brahmins to expound the doctrine of the unity of Brahman (Brahmadvaitam)" (Maha- bharata, Vanaparva 133; l8). Vandin was duly defeated in the philosophical debate and merged into the ocean, whence Kahoda reappeared. The father let his son bathe in the river Samanga. Astavakra's limbs were immediately made straight, but he was ever called Astavakra. It is worth while to refer to the intellectual disquisition between Astavakra and Vandin as given in the epic. The former obviously enters into the controversy with the object of proving the supremacy of the Upanisadic creed, although the meaning of his argument is hidden behind a citation of the numerals in which the controversialists are seriously engaged.